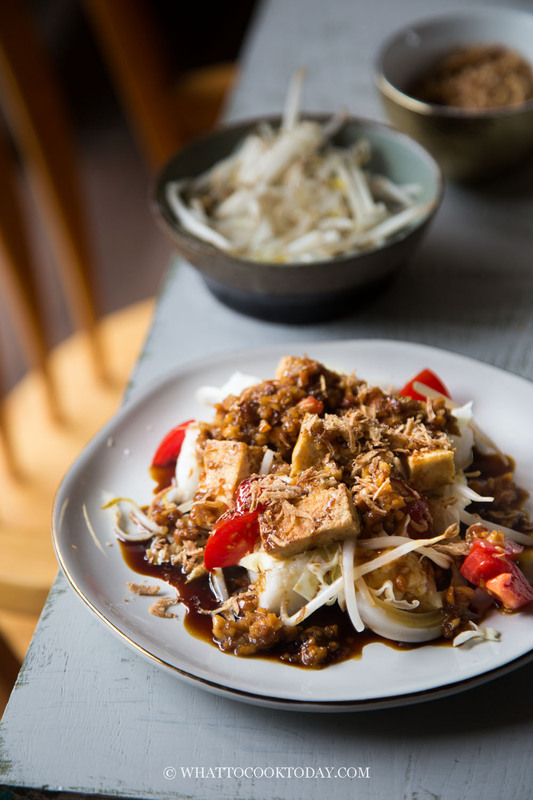 Fried tofu is served with vegetables and dressed with peanut and sweet soy sauce based dressing. A seriously humble, easy yet very delicious meal! “The grass is greener at the other side” Ain’t that the truth? At least that’s how I feel sometimes when I saw my friends posting Indonesian food they ate and here I was thousands of miles away, kept swallowing the saliva that just wouldn’t stop gushing. How I wish I were there! But I am equipped with what God has given all of us, a brain, and other body parts and senses to perform the task I want to do, re-create the food I’m missing every day. I just rehearsed the list of food that I’m going to eat if we go back to Indonesia for vacation one day. I’ll spare you the detail here. It’s VERY long!! but I can share with you one of the foods I had been craving, tahu goreng kecap! 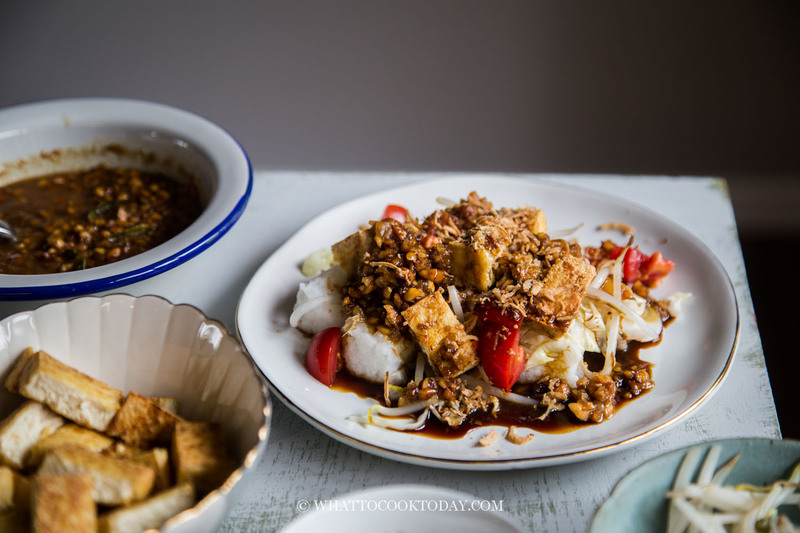 WHAT IS TAHU GORENG KECAP? 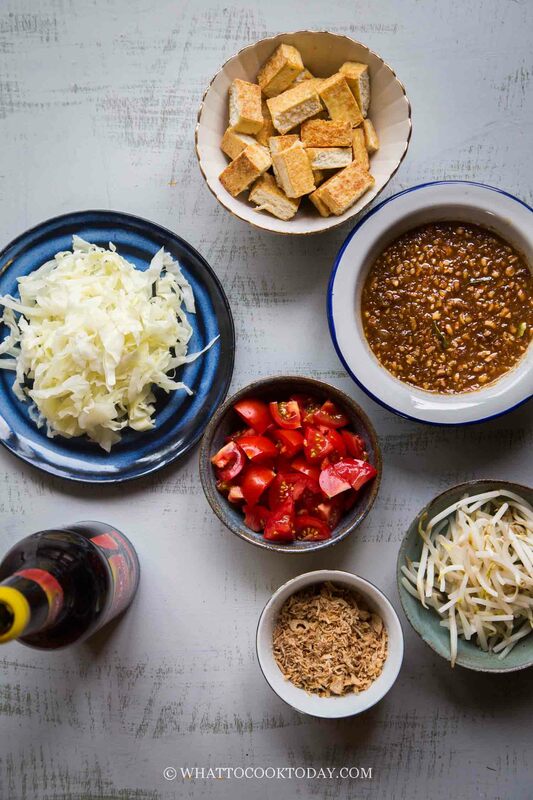 In Indonesian, tahu = tofu, goreng= fried, kecap = soy sauce. 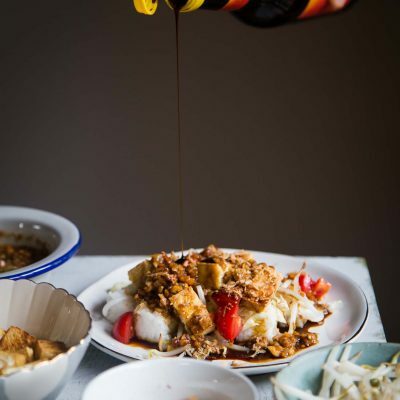 In this case, it is sweet soy sauce or famously known as kecap manis. 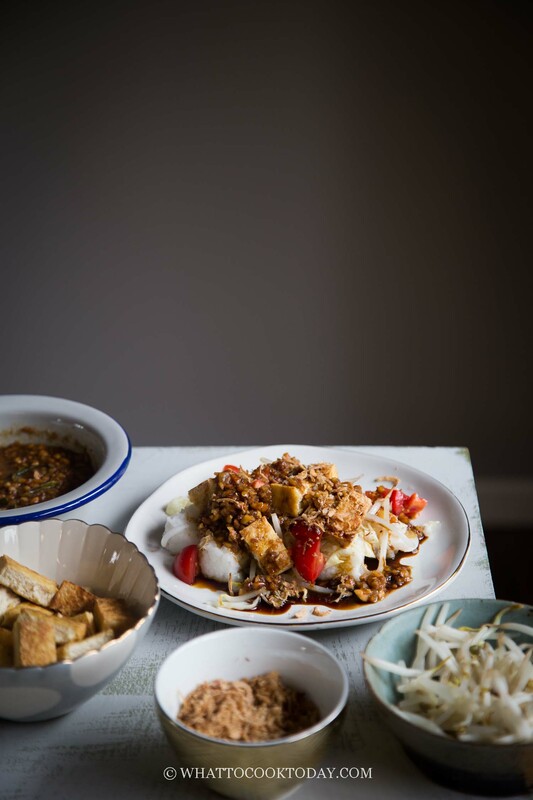 So tahu goreng kecap is basically fried tofu served on a bed of veggies such as cabbage, bean sprouts, tomatoes, sometimes lontong (rice cakes), and dressed with peanut and sweet soy sauce based dressing. 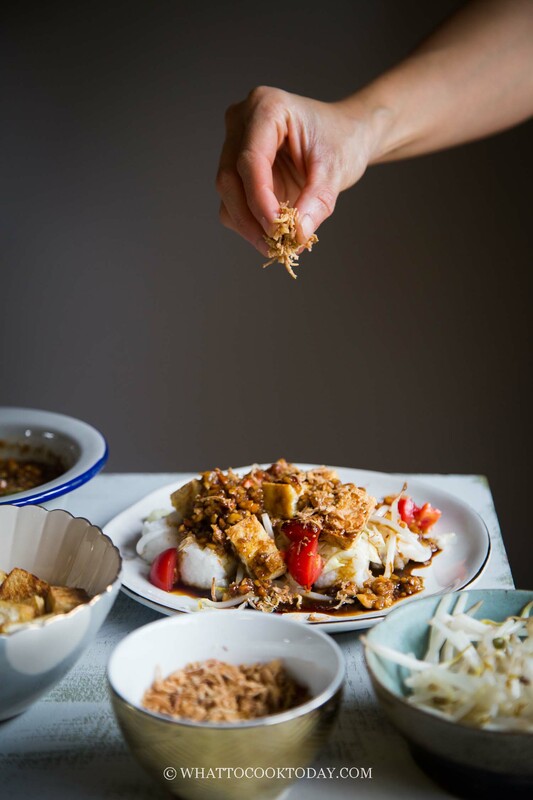 It is basically a street food that many locals enjoy. It’s cheap, delicious, and most importantly, fills the tummy! 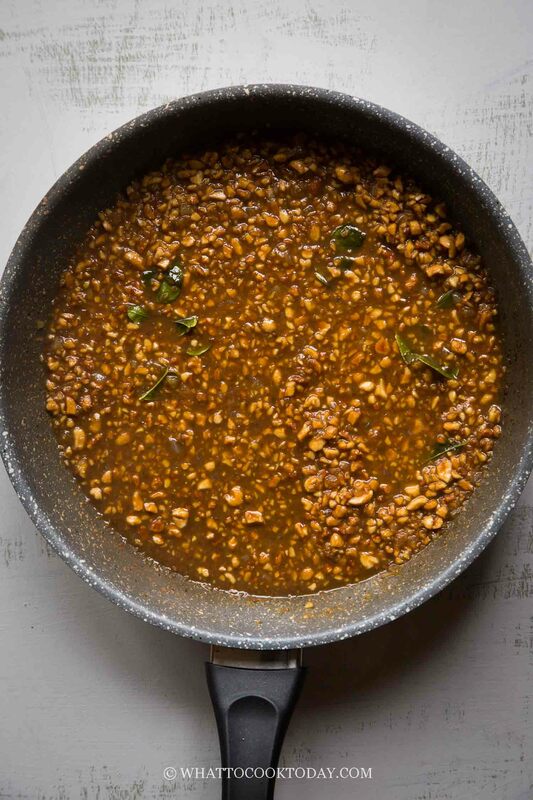 The dressing is made with coarsely ground peanuts, shrimp paste, shallots, garlic, chili (not used in this recipe), simmered in water and herbs like bay leaves and kaffir lime leaves and then kecap manis is added. The aroma is incredible! I love bay leaves and kaffir lime leaves. 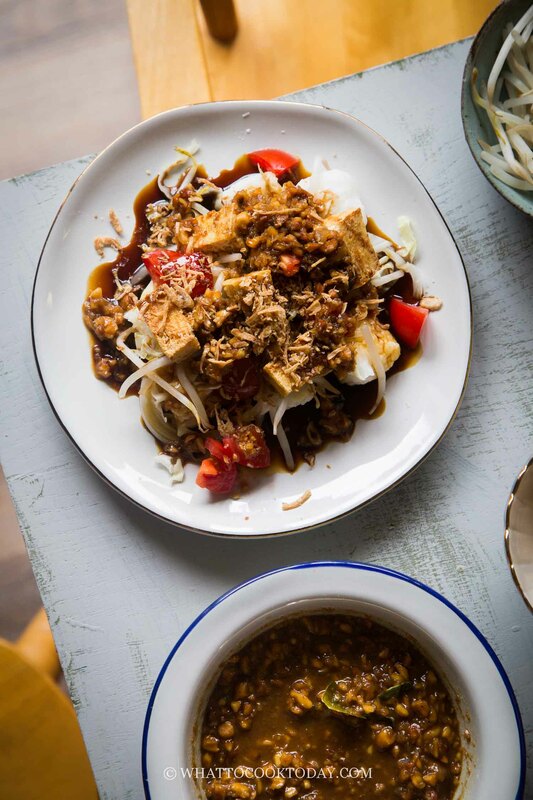 Traditionally, the tofu is deep-fried, that’s why it’s called tahu goreng kecap. The tofu is pan-fried in this recipe. I used extra-firm tofu. Find the firmest tofu you can get. I press the tofu further (you’ll be surprised by how much liquid comes out of even extra-firm tofu). 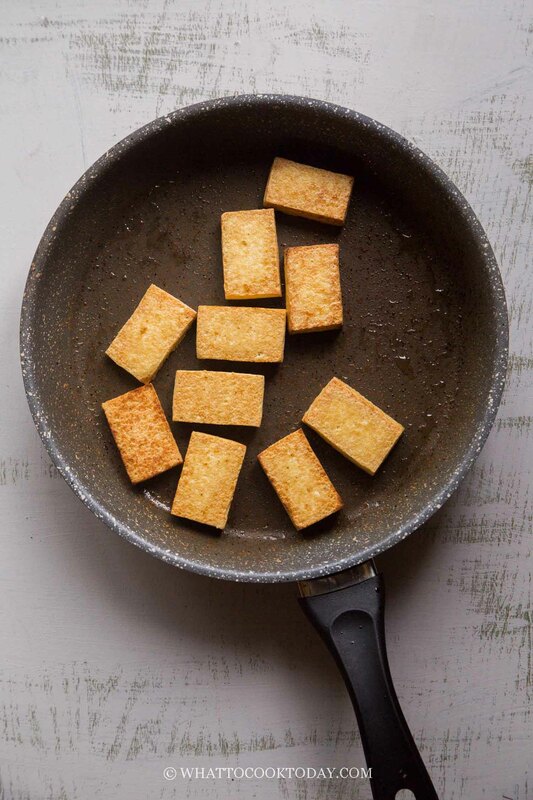 The drier the tofu, the firmer it is and the crispier the tofu will be. You don’t need to be deep-frying it. All I did was pan-frying them in a bit of oil and they are crispy. I got this Tahu Goreng recipe from my mom. Almost 2.5 years ago when I just had our second baby, she made me few batches of the sauce before she left after helping us with taking care of our newborn at that time. She was concerned that I wouldn’t have much time to cook and she made me lots of other sauces that I can deep-freeze and used anytime I want. Isn’t Mama is the best in this whole wide world? Of course by now, those sauces had long gone. It wasn’t hard to make and all and it’s my absolute favorite to make because I can eat it on its own if I want a lighter meal or pair it with some lontong or rice. 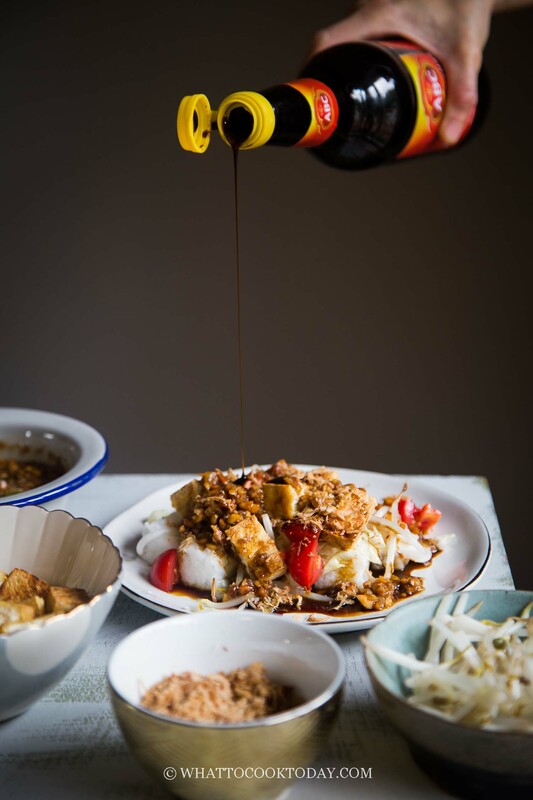 Tahu Goreng Kecap (Tofu with sweet soy sauce dressing) - Fried tofu is served with vegetables and dressed with peanut and sweet soy sauce based dressing. A seriously humble, easy yet very delicious meal! I made this tofu yesterday to fill some chickpea tortillas. It was amazing!!!!! I have made just two changes, first of all I used fish sauce instead of shrimp paste (only available online) and then, after frying the tofu, I poured the dressing in the pan and glazed the tofu with it. I had it for lunch and dinner with all the other toppings filled in the wrap. Thank you for the recipe, I am sure I will make this again and again. Oh thank you so much for trying and for letting me know !! I’m so happy you like it and good job on substituting with fish sauce. It has intense flavor that I like too !!! !